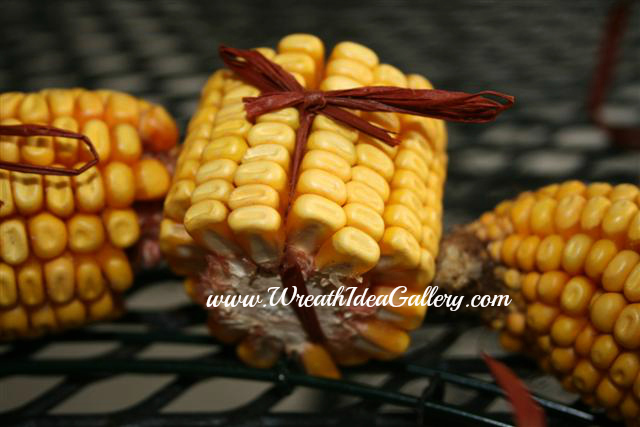 This corn cob wreath makes a great fall decoration. 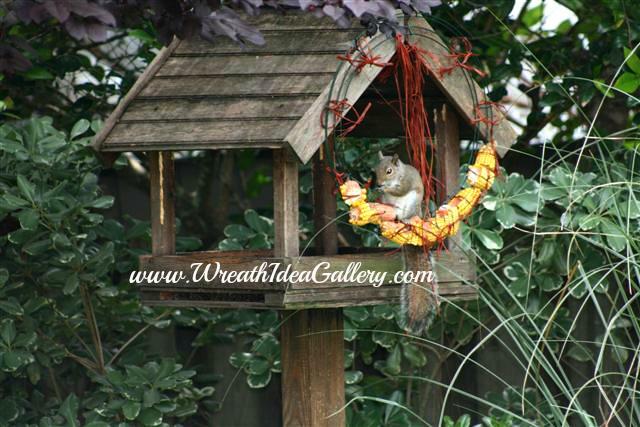 It can also be made for the squirrels and they will love it to pieces! So easy to make. I made my wreath for my squirrels and they loved it. It did not last long. I first had my husband cut the corn cobs into approximately two inch pieces. Cut several pieces of raffia in 12"- 15" pieces. 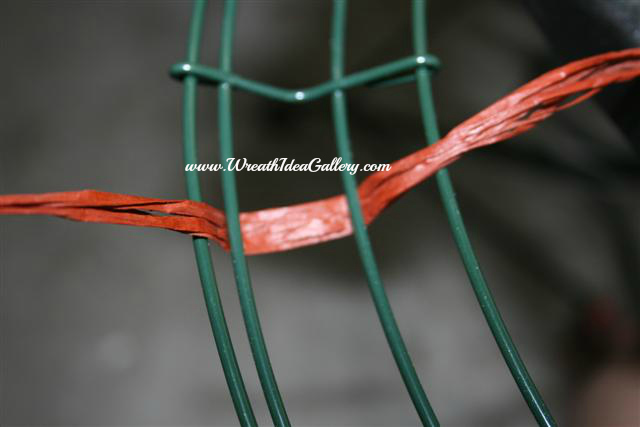 Next I tied the pieces onto the wire form using the raffia. I chose to use raffia for several reasons one, I thought it looked nice against the corn. Two, I wanted something so squirrels could get the corn off fairly easy. Three I thought it may be good for the birds and squirrels to use in their nests. 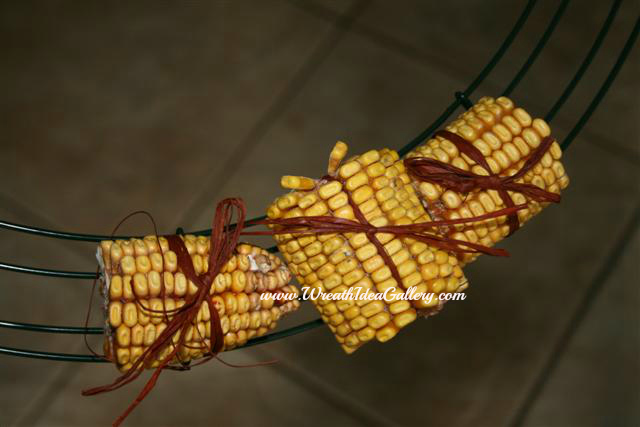 I secured the corn by going under the two middle wires (above) and letting then tying the raffia so it went between the corn rows to hold in place (below). I alternated the corn for a little texture, so one sat in the grove and is turned sideways, tying each one with a simple bow tie. 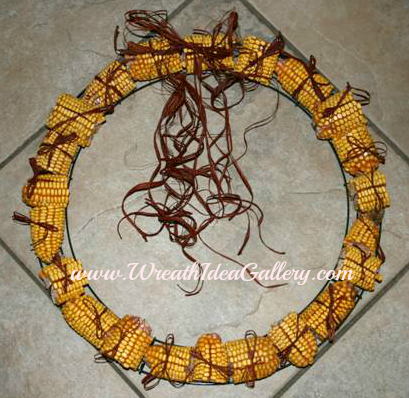 When I was finished putting all the corn around the frame, I added some raffia to the top as a bow and some extra to hang down, mostly for looks. 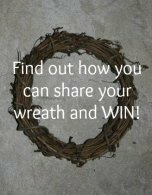 Show and tell us about your corn cob wreath. Would love to see it and share it for others to get some great ideas for their next project. I hung it on my bird/ squirrel feeder. It took a while for the squirrels to check it out but once they did it did not take them long to enjoy it completely! 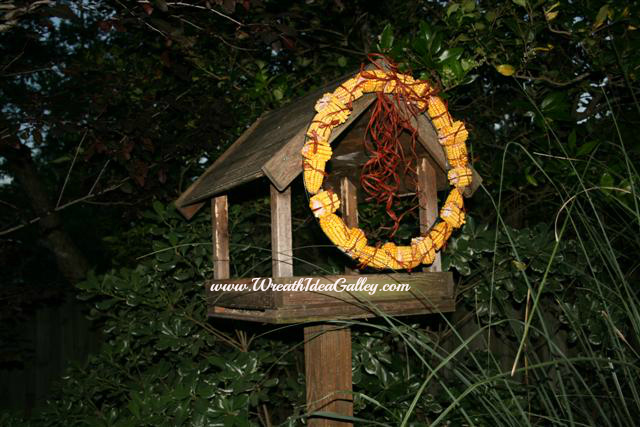 I made my wreath specifically for the squirrels; however this wreath could be made as a fall decoration. I think it would look great made out of Indian corn with all the color and texture it would look great hanging as a front door wreath or even over a fireplace.